If you are a homeowner in the United States, then certain pests can cause considerable damage to your home. One of those pests that often go undetected for far too long is termites. Unfortunately, if you are like most homeowners, then you do not know the signs that show your home is infested with termites. Therefore, you may not catch an infestation of termites until after there has already been substantial damage to your home. Termites can live in many areas throughout a home, such as in wood furniture, wood paneling and in drywall. If you have tenants, then part of your landlord responsibilities may include handling these infestations if renters bring them into your home. Termites can be detrimental to a house because they can cause damage to many different areas. To protect your home from termites, you must know the signs that your home has an infestation. If you catch the signs that your home has termites early on, then you may be able to prevent large home repair expenses. 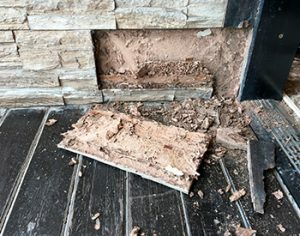 One of the first and most visible signs that you have termites in the home is if you find discarded termite wings, or swarmers, laying around. Common places where swarmers can be found include around doors and windowsills as well as other areas that lead to the outside, like garage doors and doggy doors. Termite wings are easy to spot because they are proportionally the same size. Also, you can find swarmers around the foundation of your home. Finding swarmers around the inside or outside of your house means that the termites, both males and females, are looking to mate and to find a place to start a new colony. When they see a new location for their colonies, they purposely twist off their wings since they are no longer needed. Then, they settle down and begin to create their colonies and mate. Young termites typically emerge twice a year, which is when you will find swarmers around your home. First, termites appear in the springtime after the last of the cold weather is gone. Then, they will leave the nest again during the fall. Typically, swarms vary based on the species of termites and the weather conditions of where you live. However, most swarms that occur on the outside of your home take place during the morning and afternoon hours, which is easy for homeowners to miss. Some species are even known to swarm at dusk. Therefore, to make sure that you do not miss the first sighting of swarmers, it is essential to do regular checks of all access points in your home that lead to the exterior. Termites are wood eaters, as they chew through wood as they search for cellulose. As they do so, they leave behind long grooves in the wood, which over time deteriorates the wood causing structural damage. When you conduct termites checks around the house, you should look for wood damage on doors and paneling. Since termites eat wood from the inside out, regularly tapping wood surfaces can help show signs of infestations. When tapping wooden surfaces around the home, do not only pay attention to doors and windows. Be sure to monitor walls and floors. Wood that is eaten by termites typically has an empty or hollow sound. If you are a homeowner with insurance, then you can check to see what is covered by your policy to replace damaged property. Does your wood flooring appear to have water damage? Did you know that blistered wood flooring might not be water damage at all, but a sign that you have termites in your home? Areas of your flooring that have blisters are evidence that the termites are feeding within or below the wood. Additional signs include dark spots or areas of the wood that is sagging. If you can investigate further, then you may find a series of tunnels underneath the parts of the wood that is blistering or sagging. You may also find small holes where the termites have chewed the wood. Therefore, to inspect your wood flooring for signs of termites, you would also need to tap the surface and listen for the same empty or hollow sound. Mud tubes are easy to spot since they are made of pieces of wood, soil, and debris. They are vital to the survival of the termites since it protects the colony from predators and also preserves the specific temperature and humidity level they need to survive. The tunnels allow the termites to thrive and to continue to damage your home. Another early sign that your home has termites is if there is bubbling or uneven paint on the walls and furniture around your home. Typically, bubbling or uneven paint are signs of either water damage or termites. If a check determines that there is no water damage present but there is moisture, then you should tap the area around the bubbling or uneven paint to see if any areas are soft. If so, then it could be a sign that your home has termites. When termites infest wood, they usually stay hidden from sunlight and air. Since termites need moisture to survive, they will bring their own with them. Therefore, if the termites move in behind a painted surface, then the moisture that they bring may cause the paint to bubble or peel. Also, if termites eat the wood directly behind the paint, then it can crack, peel and bubble since nothing is holding the coat of paint. Lastly, another sign that your home has termites is the site of termite droppings. As termites eat their way through the wood of your home, they leave wood-colored droppings, known as frass. Frass, which can be found in the inside and outside of your home, often resembles mounds of pellets, coffee grounds or sawdust. If you live in a southern climate, which is warm and find frass around your home, then this is a sign that your home has termites.